Tara Reid has given up her ambition to become a serious actress and has finally embraced her image as overindulgent party girl. Smart move. Why be anything other than yourself? She has fun, travels the globe in pursuit of reckless hedonism, and amuses (or disgusts) us with paparazzi photos of her falling down drunken antics. Thing is....one doesn't need talent to do what she does, so why does she have her own TV show? And have you seen the Taradise promotional image? I think they should replace the sleek airbrushed photo of Tara with one of those paparazzi photos. That way, we can see just how bloated and boozy Taradise really is. Manhattan socialite Jocelyn Wildenstein has undergone millions of dollars worth of plastic surgery to transform her once normal human face into the face of a cat. She creates such a shocking spectacle whenever she goes out in public that I decided she needs to start placing posters about town announcing her upcoming appearances. The New York press dubbed her "The Bride of Wildenstein" and recently, the National Enquirer delicately referred to her as a "rubber faced freak". She scares the hell out of people, but she's just a harmless, eccentric and delusional lady with too much money who parades around Manhattan with that shocking mug of hers and cares not what anyone thinks. But does she look like a cat? 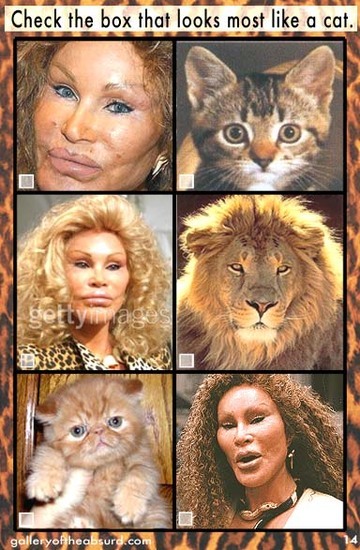 Take this handy quiz and see if you can tell the difference between Jocelyn Wildenstein and a common feline. Don't worry, the quiz is so easy that even Jessica Simpson can pass it.